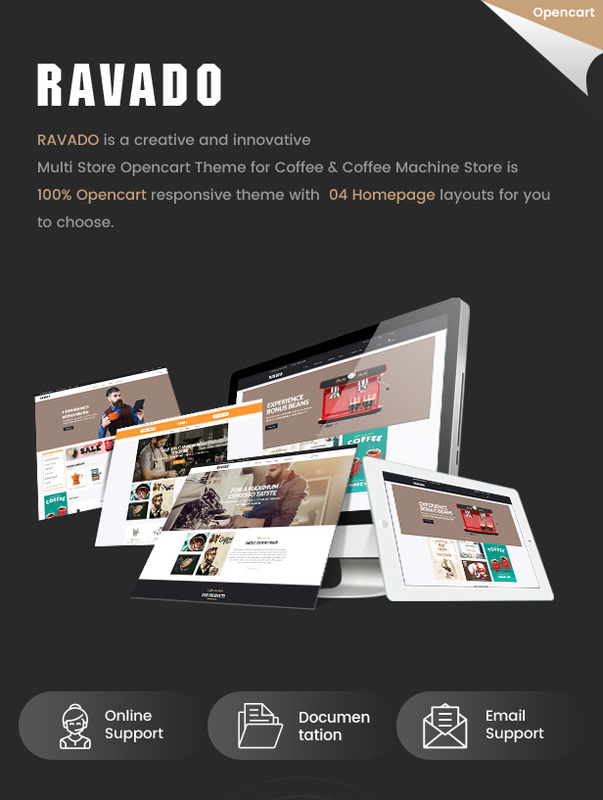 Ravado theme features image slideshow with meaning text, smooth transition, simple effect; Ajax Layered Navigation; Tab Products Slider with new, featured, bestseller in each tab or products of each category in each tab. Show featured category and thumbnail in admin panel quickly. Theme Configuration help you install other demo, define whether show quickview or not. Communicate with customers via Blog, Testimonials with posts, testmonials, review and show new promotion, latest products with nice images on Instagram. Header & Footer is neat with contact, phone, introduction about your store, social icons, internal links. Famous logos, favorite brands, your brands are displayed in slider with Brand Logo Slider. 4 homepage layouts are easy to custom and arrange with Layout Content Builder. Moreover, this theme also supplies Megamenu with multiple categories and nice images in cms block, Category module with categories in vertical direction, Related Products Slider, Dropdown shopping cart, thumbnail image slider, cloud zoom images with lightbox.